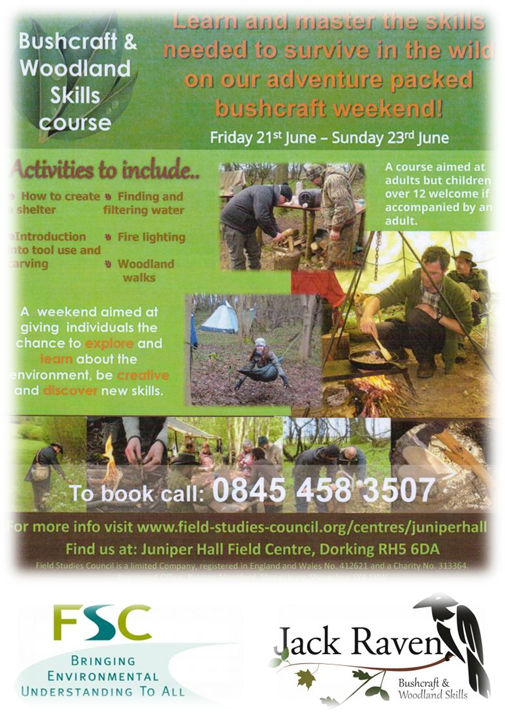 We’re delighted to be running a bushcraft course for the Field Studies Council, a registered charity committed to helping people of all ages understand and be inspired by the natural world. If you’d like to join us for what promises to be a fantastic way to spend the summer solstice weekend, learning new skills on Box Hill, one of the south east’s most picturesque locations, contact the Field Studies Council on 0845 458 3507. They are currently offering a 25% discount, bringing the cost down to only £120 per person! Established in 1943, FSC has become internationally respected for its national network of learning locations, international outreach training projects, research programmes, information and publication services, and wide range of professional training and leisure courses.